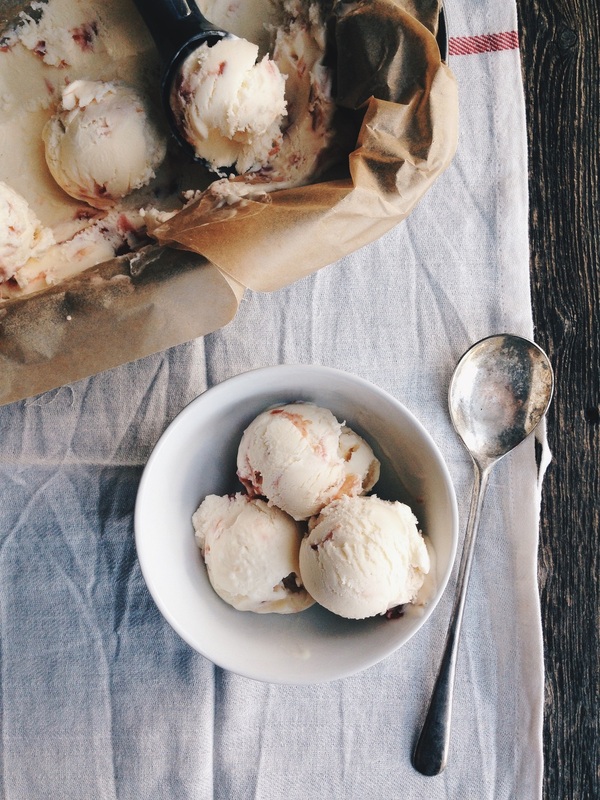 Sour Cream & Rhubarb Cheescake Ice Cream — Rustic. Joyful. Food. I've found the perfect base. Long gone are the ice crystal days of your former attempts at making home made ice cream! I've tried recipe after recipe with sad results. Sure the ice cream tastes great while making it, but after freezing any left overs I'm always disappointed. What did I need? More fat. Less water content. Heat milk, cream, sugar and split/scraped vanilla bean to the boiling point over medium heat. Whisking often. In a separate bowl beat eggs and set aside. Once the milk has come to a boil, remove from heat and in ladle 1 cup at a time while whisking into your eggs. This process is called tempering. Once you've added 3 ladles of the hot milk to the eggs add the tempered eggs back to the pan and place back over medium heat. At this stage its important to whisk continually until the mixture thickens, about 7 minutes. Remove from heat and fold in the sour cream. Pour the base into a non reactive bowl and let cool to room temperature before placing the base in the refrigerator to cool completely. Using your ice cream makers instructions per the manufacturer spin your ice cream! At the final moments swirl in your rhubarb jam. Cook everything for about 15 minutes over medium heat, let cool.